The Cross has become the ultimate symbol of love in the world. It is central to Christianity in that we are to forgive our enemies. As such, it is the single most revolutionary moral event that has happened on this planet. And, like all deep things in life, the Cross is largely a mystery. The Cross reveals God's unconditional love and vulnerability; as a teaching and an invitation to discipleship; God suffers with us. 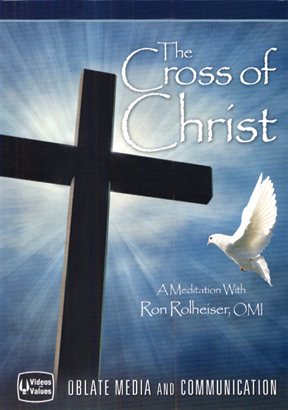 The Cross calls us beyond ourselves, our own agenda, our own life without resentment. This presentation was taped before a live audience at King's House Retreat and Renewal Center in Belleville, Illinois. This program is presented in two parts of approximately 50 minutes each. You'll be inspired and renewed with this absorbing presentation by one of America's most popular speakers on the subject of spirituality and faith. Ron Rolheiser, OMI is a Missionary Oblate of Mary Immaculate, a specialist in the fields of spirituality and systematic theology and present of Oblate School of Theology in San Antonio, Texas. His weekly column appears in Catholic newspapers around the world. He is the author of The Holy Longing , the prize winning The Restless Heart , as well as Forgotten Amongst the Lilies, The Shattered Lantern, and An Infinite Horizon.